Let me start things off with a disclaimer - I am not an economist. I don't even pretend to be an economist; I'm a nuclear engineer by training (I hold Ph.D. in Nuclear Engineering). That notwithstanding, economics (and specifically, the economics of energy) are a side interest of mine. So it was with mixed interest and trepidation when I read a recent piece by libertarian economist Veronique de Rugy from the upcoming July issue of Reason, entitled "No to Nukes." de Rugy's piece begins with an overly long introduction detailing to the reader why nuclear power was destined to fail to live up to its promises, including citing public opinion which she describes as having " remained steadfast against the technology ever since [Three Mile Island]" (although someone may want to refer de Rugy to the latest polling data on the subject), along with other issues, such as "[d]isputes over waste disposal [which] have never been resolved" (once again however, these are political rather than technical matters). Finally we get to the meat of the matter - it would appear that a restart of the nuclear industry is, "[...]not just bad politics. It’s awful economics." Well. To this end, de Rugy characterizes the recent decision by the NRC to grant Southern Nuclear company a license to build two new AP1000 units at the Vogtle site - the first new units in 30 years, as "[...]an act of desperation by a president who has realized he is running out of other options." Fortunately, contrary to the opinions of a economists with a particular axe to grind, the decision to award Southern Company is not in fact in the hands of the president, nor are operating licenses granted upon individual opinions about economic viability of the project - they are voted on by the commissioners of the NRC on the basis of safety alone. This fundamental misunderstanding of the process is pervasive throughout the rest of the piece. Much of the piece is particularly scarce on actual sources and utterly devoid of hyperlinks (however, given the fact that the piece is a re-tread of her prior post-Fukushima piece, most of her sources appear to be taken from there). 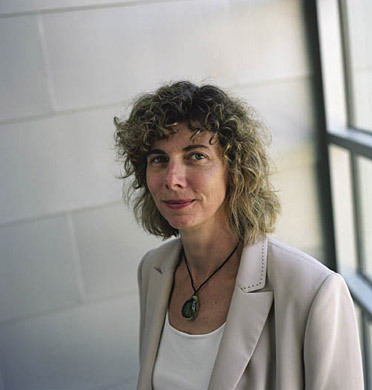 de Rugy cites a 2009 MIT study by Ernest J. Moniz and Mujid S. Kazim as evidence of nuclear's uncompetitive costs; one assumes she is referring to MIT's "Future of Nuclear Power" project which includes cost projects of nuclear compared to other conventional fossil sources under a variety of circumstances. In the 2009 update, it reports the following cost comparison: assuming current cost of capital, coal clocks in at 8.4 ¢/kWh, natural gas at 6.5 ¢/kWh, and nuclear at 8.4 $/kWh. The authors specifically note however that this includes a current "risk premium" to capital costs for nuclear - recalculating capital costs at comparative market rates (absent the "risk premium"), they come up with a number far closer to gas and coal: 6.6 ¢/kWh. Even assuming the risk premium stays, with a carbon capture and storage the cost for coal and gas quickly reaches near-parity with nuclear once more. Such an analysis is also borne out in applying levelized cost of electricity estimates to EIA data, resulting in similar conclusions. 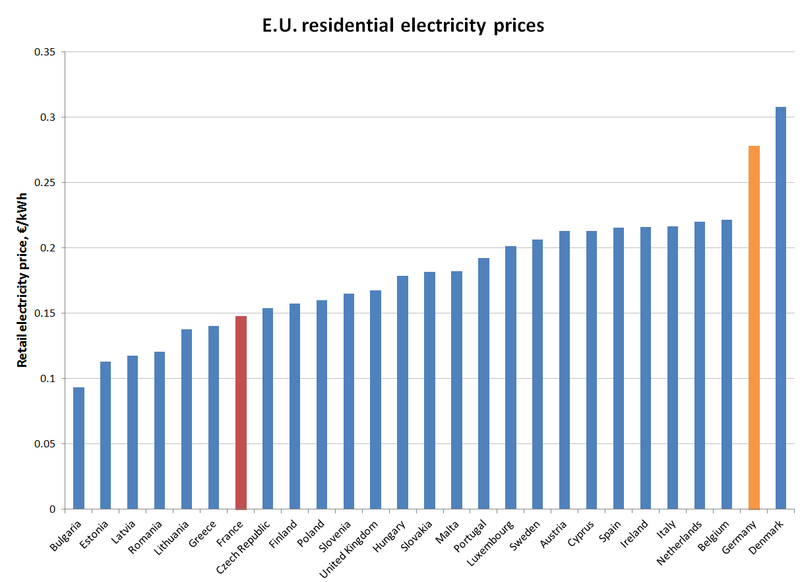 But producing nuclear energy in France is not magically cheaper than elsewhere. French citizens are forced to pay inflated costs to support grand government schemes, such as the decision made 30 years ago to go nuclear at any cost after the first oil shock in 1974. Really? Going to the data, the opposite is in fact true: France has one of the lowest retail electricity prices (the 7th lowest in the E.U. ); compare this to Germany, which has recently phased out nuclear entirely, which pays the second-highest rate. (Again, these are not hard things to find, but something de Rugy asserts with no evidence and in clear contradiction of the data.) She might try to argue that consumers pay indirectly, but nowhere has evidence been presented to support this, nor is it supported by retail electricity price data. de Rugy's main thrust here of course is that capital costs for nuclear in the U.S. are little different than those than in nuclear-friendly France, relying on the analysis of the Vermont Law School's Mark Cooper, an individual who isn't exactly private about his own agenda when it comes to nuclear. (Hint: he's not a fan.) Again, one gets the impression the data is being cherry-picked to fit the desired conclusion. de Rugy makes an incomplete comparison here, citing the high "overnight cost" estimates for nuclear capital costs compared to coal and natural gas, while neglecting to inform her readers that this alone is a highly misleading comparison. (To see how this process is properly unpacked, even with natural gas still coming out favorably compared to nuclear, I invite you to see how Dr. James Conca unfolds the data). To wit: "overnight" cost is a rough estimate of total capital cost (i.e., total money which must be invested to build the plant), assuming the plant "overnight" - i.e., without the borrowing costs (in other words, interest on loans which continues to pile up while plants are being built and not generating revenue), something which particularly dominates nuclear costs. 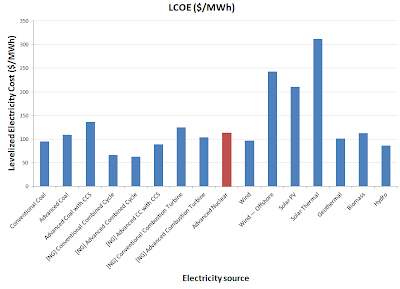 However, a more accurate comparison is the levelized cost of electricity (LCOE)- something which calculates both the capital cost and operations & maintenance costs (which include fuel - a cost which dominates natural gas economics). 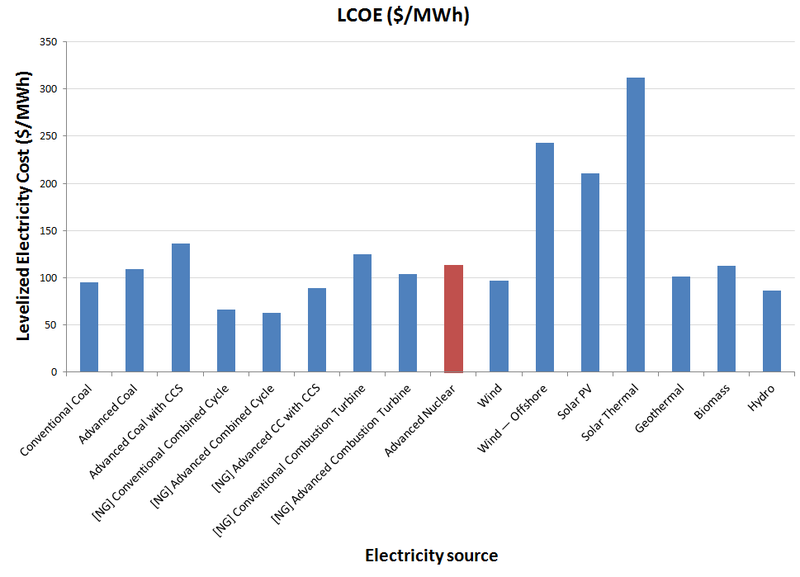 The LCOE calculates the "break-even" cost of electricity from a plant given the projected costs over the plant's lifetime, with a reasonable discount rate (for example, the expected return of ~3% on treasury bonds) over the life of the facility. Given that the expected lifetimes of different facilities can vary widely by type (i.e., the current fleet of nuclear plants will almost all be relicensed to operate for a total of 60 years, with some potentially operating up to 80 with facility improvements and upgrades), this makes for a more useful comparison of the actual cost of electricity. Once again, something absent from de Rugy's analysis. However, de Rugy comes back with the follow-up that such estimates of nuclear cost come "after taking into account a baked-in taxpayer subsidy that artificially lowers nuclear plants’ operating costs." Looking at the broader picture of historical energy subsidies however, this point doesn't seem to carry the impact de Rugy seems to think it does - from the period of 1950-2010, nuclear has been the recipient of about 9% of total federal energy subsidies, compared to a shocking 44% for oil. (For those following at home, the rest include: Natural gas - 14%, Coal - 12%, Hydro - 11%, Renewables - 9%, Geothermal - 1%). Most of nuclear's subsidy has, contra de Rugy, not been focused on the regulatory side (although the study does point to an approximate regulatory subsidy of $16 billion over the total time period) but R&D, which should surprise few who are conversant with the history of nuclear. (Oil, by contrast, receives the whopping share of its calculated subsidies from tax policy and regulation, while natural gas has almost exclusively benefited from tax policy). No doubt though de Rugy is invoking the issue of nuclear liability insurance of course (known under the moniker of the "Price-Anderson Act", passed in 1957). What is not noted is the exact taxpayer liability to date under Price-Anderson - which is exactly $0. Again, contrary to the claims of nuclear opponents like de Rugy who dress up their objections in economist's language, nuclear is not "uninsurable" on the private market - in fact, each nuclear unit is required to carry an individual liability of $375 million; following the exhaustion of the individual commercial policy, each operator-licensee is required to kick in up to another $111.9 million (pro-rated), producing what amounts to a collective cross-insurance arrangement of $11.975 billion. One can dispute whether such a sum is "sufficient," but the idea that the industry is utterly absolved of tort liability is clearly at odds with the the current reality. When I pressed de Rugy over what particular subsidies she was complaining about and why her complaint so specifically singled out nuclear (looking at her publication history, there is nary an article devoted to the issue of energy subsidies for other sectors), she responded by pointing me to an analysis she did on the market-distorting effects of loan guarantees. (This after I pointed out that I was in favor of removing all subsidies - but it would seem, like many in the punditry business, the conclusion comes first). Frankly, I won't get into all of the analysis - because once again, I am not out to defend loan guarantees or any other form of energy subsidy. However, one thing that did jump out at me once more was the use of extremely cherry-picked data in her report - the few items that do mention nuclear (most of the piece pertained to loan guarantees for solar - which incidentally, was not required to pay the credit subsidy fee which nuclear was) are, shall we say, "factually challenged." de Rugy rolls out the several-times-over debunked trope of the 50 percent default rate with nuclear loan guarantees - based on poorly-documented projections over a program which was never passed. While de Rugy immediately pointing out that the CBO revised this number (without specifying how much), the supporting evidence she gives to this revision doesn't even pertain to civilian nuclear power - rather, the study she points to is a comparative economic analysis of nuclear power for naval propulsion. The only other nuclear-specific studies de Rugy cites in this study come from Peter Bradford - a well-known anti-nuclear activist with the Nonproliferation Policy Education Center (simply google "Bradford" and "nuclear" if you don't believe me) - along with Henry Sokolski (also affiliated with the same). The extremely selective use of sources known to have a hostile agenda to nuclear (that is, when the sources even accurately refer to de Rugy's claims) again strongly implies a rushed, cherry-picking approach that implies a "conclusion-first, evidence later" approach that is all too familiar with established punditry. Indeed, it might make for impressive-looking studies (and good sound bites), but it hardly suffices for serious scholarly work. Indeed, if the evidence is as strong as she claims it to be, it would behoove her case greatly to find such evidence from more objective and less clearly agenda-driven sources. Of course, all of this is the problem: even rather sloppy studies like this, particularly when attached to someone with a Ph.D. in economics, sound plausible and require the time and energy to deconstructing their myriad of errors and misplaced assumptions - something which amounts to a non-trivial task for one when most of their day is typically occupied by honest employment, alas. The nomination of Allison MacFarlane has drawn a considerably mixed reaction among the nuclear community, ranging from NEI's rather speedy endorsement and Rod Adams' similarly rapid denouncement. Others (including myself) have chosen to withhold judgment for the time being, although I do recomend Margaret Harding's list of desirable qualities in a potential NRC chair. Given that MacFarlane's hearing before the Senate Environment and Public Works committee is scheduled for tomorrow, here are some questions which I believe would better inform the discussion both of whether MacFarlane is a good candidate to lead the NRC and what her leadership might entail. Given the size and relative impact of the NRC, it is not an agency known for its amenability to on-the-job leadership training. A particular concern is in your lack of organizational leadership experience on your resume. Why do you believe you are qualified to lead the NRC, and what leadership qualities do you believe you bring to the table? 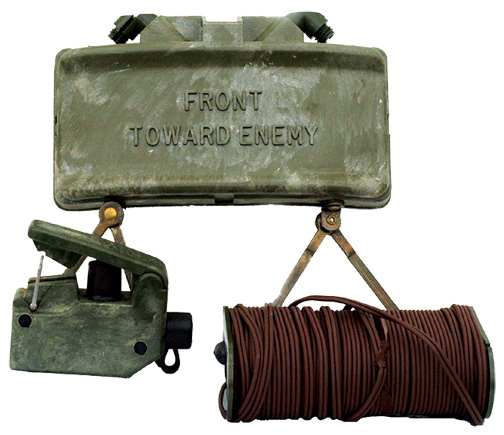 Describe what you feel are the key challenges currently facing the NRC. What areas would you focus on as chair, and how would you work to overcome them? Your attitudes appear to have evolved from being a self-described "nuclear agnostic" to indicating that "we absolutely need" nuclear energy with respect to climate change. What provoked this evolution? A prominent concern regarding your appointment to the chairmanship of the NRC is that your background has generally not focused on nuclear fuel cycle technology per se. How do you believe you can overcome this experience gap? Much of the NRC's policy comes down to producing an appropriate balance of safety with economic considerations in regulation. Please describe your thinking on what constitutes socially acceptable risks. Should the safety threshold for nuclear energy systems be higher than other commonly accepted risks, such as air travel? What about in comparison to other energy sources? A decision which has been roundly criticized by many nuclear experts was outgoing Chairman Jazcko's unilateral decision to establish a 50-mile evacuation zone for U.S. residents in Japan, contrary to both existing U.S. evacuation guidelines and the Japanese evacuation guidelines. Do you agree with this decision? If so, upon what basis? If not, where did the Chairman err and how would you handle the situation differently? As an outspoken critic of Yucca Mountain, both on technical and procedural grounds, how do you view the decision by your predecessor Gregory Jazcko, along with President Obama and Secretary Chu to terminate the licensing review process in light of amendments to the 1982 Nuclear Waste Policy Act which legally mandate Yucca Mountain as the nation's sole geologic repository? Would you allow the licensing process to move forward? If not, how then do you square this under existing federal law? One of your significant contributions to the Blue Ribbon Commission was a strong focus upon a more consent-based process of involving communities in the repository licesing process. What do you view as the NRC's role the siting process for a potential repository (if any)? What immediate actions (if any) do you believe the federal government should take with respect to spent fuel management? Your academic background includes several publications on the topic of nuclear nonproliferation policy. In particular, you have publicly stated your opposition to spent fuel reprocessing on nonproliferation grounds. Do you believe President Carter's decision to suspend civil reprocessing in the United States was ultimately effective in achieving its stated nonproliferation goals? How do these nonproliferation concerns relate to the NRC's recent license to GE to construct a laser enrichment test facility, given similar nonproliferation concerns? Please describe why you believe reprocessing of reactor-grade plutonium to be a viable proliferation concern, particularly in nuclear weapons states. What role (if any) do you see for the NRC in establishing U.S. nonproliferation policy? A particular challenge to the development of novel reactor concepts such as small modular reactors as well as entirely new reactor concepts such as TerraPower's traveling wave reactor has been the difficulty in getting such designs through the NRC licesning process. In particular, this has been described as a "chicken-and-egg" problem, with the NRC refusing to prioritize designs with no present commercial interest, while utilities are generally only interested in designs that are expected to receive NRC review. As a result, some designers - such as TerraPower - plan on circumventing the U.S. market entirely. What do you believe the NRC should do to address this issue? Nuclear experts such as Rod Adams have pointed out that the existing COL process relies on the assumption that no amendments to the design will need to be made after construction begins. Does this process need to be improved? If so, how would you propose improving it? Departing chairman Jazcko was frequently the lone dissenter on several recent votes for involving reactor licensing and construction, including the construction licenses for Vogtle and VC Sumner reactors as well as the recent 20-year license extension for the Pilgrim nuclear facility. Do you believe Jazcko's dissenting votes were justified? If so, on what grounds? If not, how would you approach the situation differently? What questions would you ask MacFarlane, given the chance? Update: Margaret Harding presents her own list of questions, and Rod Adams posts a transcript of his 2007 interview with Dr. MacFarlane in which she declares herself as an "atomic agnostic." Update II: Jack Spencer at Heritage's blog similarly poses his questions. Some substantial overlap in themes arises - particularly over issues such as Yucca Mountain and new reactor licensing.